While there are some people who prefer solitude and independence, most people are social by nature, and they desire friends to laugh and struggle with in both the good times and the bad. Good company is invaluable, and thus it is important to distinguish who your true friends are. Genuine friendship should not rely on a relationship that is give and take, but rather a relationship based on mutual respect, trust in one another, and unconditional support. A good friendship takes time to mature and develop into an unbreakable bond, and oftentimes requires that friendship to undergo trials and tribulations. One Week Friends explores this concept and follows the growing relationship between Hase Yuuki and Fujimiya Kaori and the struggles they encounter as they begin to understand the meaning of true friendship. Set in an ordinary high school, One Week Friends tells the story of Fujimiya Kaori, a girl who mysteriously loses her memories at the end of every week. What makes this situation even more complex is the fact that she only loses those memories that involve people she befriends. For this reason, she distances herself from everyone else and appears to have a cold demeanor. Hase Yuuki, a boy in her class, notices that she is always alone and resolves to become friends with her and summons the courage to talk to her. For a typical high school boy meets girl slice of life show, the story is nothing special; in fact, the whole memory loss of only friends concept is quite farfetched and unrealistic, even for an anime show. However, looking past that fact, the show is quite adorable and heartwarming. From watching Hase slowly help Fujimiya overcome her condition to laughing as Shougo scolds a hopeless Hase, One Week Friends does a good job of making you smile and induces a rather wide range of emotions. It is slow paced and mellow, but that adds to its charm and the relaxed environment of the show. The small amounts of drama are handled well without getting out of hand or being needless. Disregarding the unrealistic aspect of the show, the characters themselves are quite realistic and are characters that are relatable and likable. Hase represents our typical awkward high school boy. While slightly airheaded and bad at studying, he does have a kind heart and has the patience and persistance needed to befriend someone like Fujimiya. However, he is human, and this is made apparent when he struggles with the problems that arise due to the complexity of Fujimiya's situation. He is quite selfish, becomes easily jealous, and can be immature at times, yet gives it his all and has a genuine desire to befriend Fujimiya and wishes for her happiness. Hase is appealing as a male MC for this reason; his personality is realistic and basic. Fujimiya is our innocent and earnest girl whose biggest dreams include doing fun things with her friends. It is hard to imagine how incredibly lonely and depressed it would be having to purposefully ignore everyone while in reality you want nothing more to befriend them. She decides to shoulder her problem by herself, and doesn't want anyone else to get hurt because of her illness. While she appears mean and unfriendly, she's actually a cheery girl who has an affinity for math and cooking. Hase helps her slowly open up and become more confident in herself, and to not be afraid to make more friends. Surprisingly, the supporting characters are fairly well developed and come into their own as the show progresses. Shougo is Hase's voice of reason and a guy who never seems to care much for anything. Extremely blunt and logical, he isn't afraid to speak his mind. He's constantly helping and advising Hase, and while he treats it as a bothersome task, he always seems to come through with solid counsel. For someone that seems unmovable and aloof, he is unusually helpful as he also helps Yamagishi Saki, an old elementary school classmate of his. A forgetful girl who is clumsy and often teased because of it, she sees Shougo as a reliable person who could take care of her, and her relationship with Shougo is unconventional but interesting and adorable to watch as they deal with their feelings for one another. While there are hints of it, romance is not the central theme of the show. It can be easily seen that Hase doesn't consider Fujimiya as a simple friend, but the show doesn't emphasize it. Shougo and Saki's relationship is also clearly not just being casual friends, and while you get the feeling that there is something more between the two, the show is quite subtle and indirect about it. I'm sure that many people want to see Hase and Fujimiya together, or Shougo and Saki together, but dating and romantical relationships is a much more minor aspect of the show. Whether you don't mind or consider it frustrating, there are still many more enjoyable aspects of the show. The show, being an adaptation of a 4-panel manga, has a quaint and delicate art style. Everything seems relaxed and the art reflects that feeling. The character designs are simple and fit their personalities quite well. The opening and ending theme songs are vibrant and mellow, and are nice to listen to. Being a typical slice of life set at a high school, the music and art both follow the standard conventions of the genre. No complaints about either art or sound, but nothing that deserves a commendation. One Week Friends takes a delicate subject and an unusual setting and turns it into a nice slice of life high school story that may just make you laugh and smile. While the premise of the show is a bit too convenient and unrealistic, the charm of the show lies in its character development and tender moments. The show addresses a basic yet essential aspect of life that is present in most of us and presents it in a nice and heartwarming way. 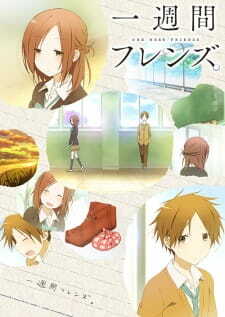 The plot of Isshuukan Friends consists of a young boy (Hase) who is in love with a beautiful yet estranged girl (Fujimiya). The girl suffers from a condition in which parts of her memories are erased on a weekly basis, on each Monday. This makes it so that Hase, in order to befriend her, is required to introduce himself to her constantly just to keep up their friendship. It also makes for one of the most frustrating anime to watch; it contains one of the biggest "love that never was". Isshuukan Friends is structured in a way that every single episode, more or less, plays out like each other. It is the same uniqueness that makes it stand out that also hurts it. For Hase and Fujimiya, developing a friendship is already difficult enough, let alone a love-relationship. If you are looking for some sort of intimacy between the two main characters, you won't find it here. Of course, Hase and Fujimiiya's relationship isn't the only thing that is worth noting of Isshuukan Friends. The core side characters, Kiryuu and Yamagishi, are absolutely hilarious. They honestly make up for half of the show's enjoyment; one is stoic and carefree (Kiryuu), the other is clumsy and careless (Yamagishi). Together, they make the various slice-of-life moments in Isshuukan Friends a little more crazy, and all the more enjoyable to watch. The "turning point" in Isshuukan Friends (if you can even call it that) occurs around episode 7-8, in which a new character, Kujou Hajime, is introduced. Since "Hajime" is a perfect pun of a name, we can assume that his introduction will lead to the climax of the story. And for a while, it does indeed seem like that. However, just as quickly as Kujou was introduced does Isshuukan Friends revert to its original plot. What could have been a suspenseful, possibly drama-filled ending ended up falling flat on its face. It's such a shame to see something that great go to waste. Now, one of the things that Ishuukan Friends was able to capitalize on was its art. Fitting nicely into its Spring debut time, Isshuukan Friends used quite palatable colors, mainly light ones. Its color scheme is definitely something that is not commonplace in most anime, and that uniqueness in itself makes it a refreshing change of pace. With heavy focus on yellow, orange, and white, this is an anime that simply radiates "springness". If springtime flowers come off as beautiful to you, Isshuukan Friends's art should do the same. Originally a promising prospect, Isshuukan Friends took an unfortunate nosedive toward a circular plot, one in which the beginning resembles the end. In a romance anime where the main characters do not develop a love relationship, the main draws would then be its art and side characters; and it's true, those two aspects really do serve to hold this anime together. For what it's worth, Isshuukan Friends is an enjoyable watch. However, don't expect to get anywhere by the end; this is an anime in which you really should focus on the ride, and not the destination. However, is this a ride strong enough to overcome the lack of a destination? To that, I would have to say no. A show about making friends that can be said in 5 simple words. You might think that could turn into a century old trope but Isshuukan Friends (One Week Friends) does something different. It revolutionizes that very simple idea of making friends to bring about a show that is so much more. Based off the manga of the same name written by Matcha Hazuki, making friends is more than just reaching out and extending your hand. Taken for granted, Isshuukan Friends has a very simple premise. It’s about making friends. The title itself is also easy to take notice as translated to “One Week Friends” because main characters Yuuki Hase and Kaori Fujimiya become friends for one week before she loses her memories in the case of amnesia. The show is honest and to the point but at the same time thought provoking. After all, making friends can be simple for some people yet could also be the most challenging task in the world for others. Step in the shoes of Kaori Fujimiya, she could be easily be depicted as the one meeting facing such a challenge. At first glance, there’s a lot of contrasting traits between Hase and Kaori. Hase is cheerful, outgoing, and is easily able to make friends. His strength lies in his ability to make other Hase feels good about what’s around them with his personality. On the other hand, Kaori is shy, repressed, and in general a solitary girl with little friends. Her strength is mathematics in class which is awful at. Taken for granted, the two doesn’t exactly match together as cookie and dough. Yet, there’s a unique connection between them. From minute one they meet, there’s a friendly atmosphere that Yuki brings towards her. His honesty and sincerity is worthy enough to allow Kaori to be open towards him and even others. The catch is the amnesia because she forgets every moment they’ve spent together for that week. It’s a heartwarming story yet with a slight taste of tragedy because of Kaori’s circumstances. As evidenced from flashbacks, Kaori was put into a situation that made her the way she is today. Not exactly the fun way to grow up I’d say. Friendship is a key theme in the show. Almost everything builds off from the friendship that Kaori and Yuki share each episode. They learn more about each other and do simple yet meaningful activities together whether it’s studying, eating bentos, or karaoke. In essence, they craft memories but only Yuki is able to remember them. However, it’s also noticeable that Hase’s effort is not entirely fruitless. Throughout the series, Kaori is able to retain some of those precious memories. Take it as a treasure but every day, every hour, every minute, every second that the duo share is build off of friendship. Despite being the main characters, others does get involved in the story as well such as Hase’s best friend Shogo and his classmate Saki. Both of them have contrasting personalities but plays an engaging role in the story overall with their persona. To further cement their roles, we see how they are able to bring together Hase and Kaori together in the form of an inner circle. But for what’s worth, it also ties back together the main concept of friendship. We get it as a simple idea but there’s a complexity behind it as well. Remember, Kaori forgets her memories every week with the friends she makes. Those precious memories might have once existed in reality but remains a fantasy for her. We see a glimpse of Kaori’s sadness behind her façade as she truly wants the friends she made be close to her. At the same time though, there’s also a charming presence we get from the way she reacts towards sincere moments. She takes friendly gestures, especially from Yuki, for what’s worth. In fact, Kaori even returns Hase’s friendship with her own actions and the two become like peas in a pod. There are also other feelings this show can bring out quite well. For one, there’s honesty coming from Shougo and his words. He never hides anything from his friends and can be described as a sarcastic guy but with a warm heart. One other obvious feeling is the thought of romance involving Yuki. There are big hints but Kaori remains rather oblivious. But unlike usual cliché, there’s no misunderstandings, cheesy, or tsundere responses. Instead, we get innocence and even realistic feeling of relationships connected by friendship. It builds off seamlessly integrated scenarios related to the events of their time together. And regardless of amnesia or not, the time they spent together is real. There’s no taking back that, not now or ever. As innocent and heartwarming the show is, Isshuukan Friends isn’t shy to demonstrate maturity. Characters grow and become like part of a stage play where they each possesses their own unique characteristics. But the biggest skill of the show is to tell a story. It doesn’t need to be linear or arc format to transit thought. Rather, Isshuukan Friends demonstrates slice of life by telling and showing the story of how these characters share friendship. It might sound a bit dry and cheesy. However, the way this show does it is delightful. The comedy doesn’t get in the way and neither is it forced. There’s no asinine sarcasm exploding like or love polygons with people getting hurt over trivial love. The drama only touches the surface of how friends come together and can be relatable. Remember the first time you made friends with someone? There’s that special feeling and this show brings explicitly out that idea to its very best, formulated with its unique gimmicks. The artwork has a charming and colorful background to illustrate its innocence. It’s delicate with bittersweet moments decorated by the natural style of its backgrounds with some resemblance to Usagi Drop. Characters are designed to demonstrate their innocence such as Kaori’s frail stature. Camera angles are focused and sometimes lengthened during more memorable moments to accurately show how much they are worth. It’s more than just the classic ‘a picture is worth a thousand words’. Instead, it creates feeling of emotions. The carefully concentrated focus on the eyes shows feelings from the characters and their personalities. It’s how the show lets the viewers know its feelings by showing rather than telling. No fan service or absurd misunderstandings. What we get feels real and is real. Soundtrack is pleasant and lighthearted. That should be the given with everything already shown throughout each episode. The OST has a beautiful rhythm and is gentle that stays in unity with the atmosphere of the show. Character voices too are soft-spoken with characters such as Kaori and Saki. And while the guys’ voices sometimes can feel monotonous, they command honesty and sincerity. The OP & ED songs has a similar way of showing its style to match the overall premise, one that is endearing. Isshuuken Friends is anime that anyone can watch firsthand. It’s charming, innocent, relatable, and beautiful with its aspects. Its drama isn’t forceful and neither does the story go off track with any trite of clichés. Although the story may feel slow at times with its pacing, the reward and patience is worth it. Take it as a gift, similar to how you feel like when you made your first friend. That’s how the show will feel like, one which is rewarding. Because friends are like treasures, this show is one that I definitely cherish. A heart-warming and satisfying story centering around true friendship and the subjectivity of memories and all the meanwhile it doesn't get too stifling in the process of the story: Isshuukan Friends. Such a marvelous story that people should give a watch. Story: Isshuukan Friends is about a girl named Fuijimiya Kaori who has post traumatic stress disorder, and her memories reset every Monday. One day, she meets a boy named Hase Yuuki who wants to be her friend, and the story starts from there. As Fuijmiya continuously forgets who Hase is, Hase tries to keep their friendship alive, or start their friendship anew, again and again by asking Fuijimiya to be his friend. In this friendship/romance anime, there's no love triangle, violence, or anything crazy like that. It’s about making friends, maintaining friends, and going through problems with friends until the end. Very touching and well-written plot, I thought. A very innocent and pure story. Art: I don't know exactly how to rate art in an anime because I never really dislike art. The art in Isshuukan Friends was really colorful, and to me, it seemed like the character’s artwork reflected the character’s personality. Sound: No special music that really caught my attention, but the opening and ending songs were lovely. Characters: The characters themselves are interesting and really likeable. Fujimiya is a girl who puts up a nonchalent and somewhat cold personality act, even though inside she's innocent, and kind. Hase-kun is a boy who is naive, innocent and persistent. Alongside the main cast, are the side characters that bring realism of friendship into the anime. Kiryuu is Hase-kun’s best friend, who serves as a quiet, bored and wise wing-man friend. I really liked him! Throughout the anime, characters grow. Their relationships bud, with Fujimiya remembering trivial details about friends, Kiyruu showing more of his dear side, and Hase’s determination to repetitively be friends from scratch again with Fujimiya taking ups and downs. We are also introduced to the bad guy later in the anime, although he's not really a character the audience hates, but rather can relate to. I loved all the characters really, their liveliness added to the plot. Enjoyment: I really enjoyed watching Isshuukan friends, despite it not having any really memorable moments, the entire story was just relaxing, touching, and feel-good to watch. Isshuukan Friends is a good anime to watch when you're feeling bored, sad, and tired. It should make you feel better, I think! A bento is a famous home-packed meal that can be seen very often in anime. It holds a special place in Japanese cuisine because it is prepared and arranged with love and care, therefore symbolizing an intimate connection. Let's take a look at 20 of the most delicious bento anime has to offer!